Andy Warhol said we all get 15 minutes of fame. Mine was from halfway in the third quarter at Subiaco on Friday night when my Eagles led the premiers by 6 goals and victory was assured until the fatal moment when Nic Naitanui landed awkwardly on his left knee. A couple of months ago the Avenging Eagle and I booked a 10 day holiday on the Bellarine Peninsula for the extended family at Grand Final time, not thinking for a minute that the Eagles would be there again. Golf, wine and the Almanac lunch were the likely highlights, not the Grand Final Parade. But now I believed. Our relentless run and pressure were back the last two games. We dominated the clearances and contested possession. A Sam Mitchell pass hit Andrew Gaff lace out. The Eagles defensive web had reduced the Hawthorn forward line to a telephone box where even Cyril could not find space. Hodge was brave Horatio guarding the bridge across half back being overrun by marauding hordes in Blue and Gold. Bradley Hill played with all the skill and bravery of a pending Docker. In my mind I was centre stage with John Harms at the Almanac lunch on Grand Final eve recycling my 2015 bon mots and predictions, explaining they were a year early not wrong. Adam Simpson had timed the Eagles preparation like Bart Cummings and now we were finishing all over other contenders in the finishing straight on Derby Day. The hesitancy and slow ball movement of May and June was gone, replaced by relentless run, slick movement and assured ball handling. Nothing in sport or life is certain, but I know a genuine contender when I see one. All the elements of a serious finals competitor were there. Kennedy and Darling making Frawley and Gibson look slow and hesitant. LeCras and Cripps humming like honeyeaters. Jeremy McGovern plucking marks with boyish insouciance like kids pluck apples from the branch. Hurn, Wellingham and Sheppard charging from defence like buccaneers with cutlasses. Priddis, Gaff and Shuey have been a sound midfield trio all season, but now Sheed, Hutchings, Yeo, Masten and (even) Jetta had joined the ensemble to transform it into a glorious choir. Scott Lycett bustled and bumped and ran forward to reveal McEvoy and Ceglar as hapless water buffaloes. Then the horror. The horror. The beautiful bird with a broken wing. Nic Nait – our talisman. The sun that all the Eagle’s planets orbit – suddenly eclipsed. Struck down in his finest hour. Like Roosevelt and Curtin at the end of WW2. Nelson at Trafalgar. Victory seemed assured. The enemy too broken to make up lost ground tonight. But Nic Nait could only hobble on crutches – an elephant on ice – when the ticker tape of applause showered down from the stands at game’s end. The last quarter played out in hollow fashion. The battle won but the campaign seeming lost. The beautiful girl you dated for a month that said “not tonight” and then didn’t return your calls. The short half head in the last leg of the quaddie. Chocolates to boiled lollies. What might have been. Without Naitanui my Eagles are a handy to good side. Nic Nait is three men. Most obviously his tap work. While he has hard hands his body pressure at marking contests around the ground often brings the ball to advantage. The greatest loss is his tackling, clever handball and immense physical pressure as the AFL’s most relentless midfielder. Now we need a little luck to get an unlikely double chance or more probably a home Elimination final where, even wingless, we would overpower the Dogs or Kangas. Adelaide’s midfield and clearance work looked timid on Saturday night. Sloane looks likely to get a holiday. Buddy’s hip may niggle for weeks. Paddy is surely attractive to Bell’s Beach sharks while surfing in that coat and tie. Not that I am wishing misfortune on any other team or individual. To my eye the Hawks have glimpsed their mortality. Clarkson’s tactical genius has squeezed the last drops from the lemon (“lemon tree very pretty and the lemon flower is sweet but the juice of the poor lemon is impossible to eat”). Burgoyne, Hodge and Lewis are as tough and clever as ever – but in defensive rebounding roles as the Eagles repeatedly won the clearances. The equally unlucky Ceglar and the pedestrian McEvoy were soundly beaten in the ruck and the Hawks midfield outmatched. The lack of a tall marking forward means that the Hawks small forwards rely on space and quick ball movement. Reduced to playing catchup the Hawks strength is their kicking skill and efficient ball movement. I hope the umpires soon penalize their scragging and slow ball return after marks and free kicks. It is NRL-style professional time wasting to allow their defence to man up and they are allowed to get away with it like they get away with the Mitchell stiff arm and the Cyril “marking attempt” to split the pack. Their main hope is the wide spaces of the MCG and fine weather. I doubt they can win a final away from home. And they need their home strip. Friday night’s looked like a bbq apron with a premiership medal on each breast and a sponsor’s logo mid centre at the bottom. Was that a map of Tasmania? I struggled to sleep on Friday night. So much adrenaline tinged with disappointment. Like an ice addict smoking dope to finally sleep. Too many uppers and downers at the one time is a fatal brew. 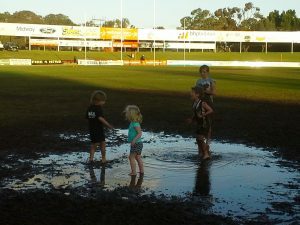 Disappointing golf (swing revision #126) and a desultory 8 goal loss by my nephew’s Swan Districts in the Bassendean mud followed on Saturday. At least these kids knew how to enjoy themselves after the game. West Coast: Kennedy 5, Darling 3, LeCras 2, Yeo, Jetta, Shuey. Hawthorn: Gunston 2, Sicily 2, Burgoyne 2, Whitecross, Lewis, Breust, Puopolo. West Coast: McGovern, Priddis, Kennedy, Gaff, Hurn, Hutchings, Lycett, Naitanui. Hawthorn: Burgoyne, Hodge, Lewis, Birchall, Smith. ATTENDANCE: 38,581 at Domain Stadium. Hey Beautiful Dreamer – do you want the Bing Crosby or the Roy Orbison version played at the wake? As a football, and sport fan, when a talent like Naitanui goes down always leaves a sick feeling. Hope his comeback is quick & successful. Hope to still see you centre stage at the Almananac GF lunch with Harmsy regardless if West Coast make it to the big game or not! The hardest thing to watch in our great game is knee injuries. Awful. “Disappointing golf (swing revision #126)” is something I know a little about too. I understand that Friday’s game will be the first without a Melbourne team in more than a decade. Fabulous writing as usual , Mr. P. B.; and your description of the utterly outplayed Hawks too depressingly accurate for mine. but thanks anyway. It’s a temporary and tenuous grip we have on things, at all times. At least you had 22 Rounds. Dane Swan took my mojo with him Quarter 1, Round 1. It’s awful. And the slate of 2017 wiped at the same time. Time. May or may not heal.